First, the administration revealed that enrollments for Obamacare next year will barely hit 10 million, far below previous projections. “That these deductibles are so high is clearly one of the reasons people aren’t buying a plan—they simply don’t see themselves getting anything for the money,” Robert Laszewski, president of Health Policy & Strategy Associates, a business and policy consultant, said in a newsletter on Monday. Department of Health and Human Services officials insist that there are still plenty of plans available with low premiums for those willing to aggressively shop on the federal and state operated insurance exchanges. Americans have until the end of the year to enroll for the third season of Obamacare. But even in cases where consumers find good deals on premiums, they are likely to be stung on the back end by requirements to pay sizeable out of pocket costs before their Obamacare coverage actually kicks in. The average annual out-of-pocket costs per worker increased nearly 230 percent between 2006 and 2015, according to an annual survey of employer health benefits coverage by the Kaiser Family Foundation. Indeed, in many states more than half the plans being sold on Obamacare insurance exchanges have a deductible of $3,000 or more, according to a survey by the newspaper. For many, that means they must pick up the cost of many routine doctor visits and treatment, while counting on their insurance primarily for catastrophic or other major medical expenses. In Miami, the median deductible for health insurance is $5,000, with half the plans above the median and half below it. In Jackson, Miss., the median deductible is $5,500. In Chicago, it is $3,400. And in Des Moines, Iowa, it is $3,000. 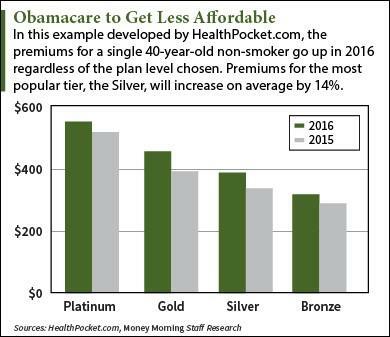 According to HealthPocket.com, Bronze plan deductibles are rising on the Obamacare federal exchanges by an average of 11 percent to $5,731 and Silver Plan deductibles are rising by 6 percent to an average of $3,117. Health care policy experts say insurers designed their plans with substantial rising deductibles and other cost-sharing measures as a way to encourage low and moderate income Americans who qualify for federal subsidies to try to hold down their medical costs. Moreover, advocates of this approach argue that even with the higher deductibles, enrollees nonetheless benefit from preventative services like mammograms and colonoscopies and other visits with doctors that are provided without out-of-pocket payments. But that provides little solace for many consumers who have been stunned by the overall cost of their policies. Many are simply not buying new policies – preferring to pay a penalty of $695 and gambling that they won’t encounter steep medical costs.